The Brewista Smart Brew Automatic Tea Kettle is the perfect choice for those mornings when you want your tea ready at the right temperature and perfectly brewed. You no longer need to worry anymore about over steeping, not getting the right temperature, nor waking up in the morning and waiting until your tea is ready. Another advantage is that it is able to brew coffee, probably not as well as a coffeemaker, but it gets the job done. the setting will be memorized for the next time when you want to prepare a tea. I could say one thing about this tea maker, its that it is the best invention for tea and coffee lovers. The tea-making process has never been easier. This tea maker is the real deal when it comes to making tea. With two tea filters included, it can brew loose leaf or tea bags. The Pump Function allows customizing steep time from 30 sec. to 8 minutes, a feature that prevents over steeping of the tea. This makes it perfect for tea lovers to whom are always trying new types of tea that need a specific time of steeping such as the oolong tea. How does this pump function work? Once you set up the water temperature and the steeping time, push the start button or use the Auto-start feature, the brewing process will begin. Unlike other tea makers on the market that lower the tea basket in the water, the Brewista uses a pump mechanism that pulls the hot water through the handle to the top and pours it over the basket. The underside of the lid is designed to disperse the water like a shower head for even distribution. The water is repeatedly cycled through the pump as the timer counts down, and once the cycle has ended, the pump stops and your tea is ready and you will hear a beep that indicates the pump function is finished. This is much better as the water is circulated during the brewing process. You may be concerned that the pump can be noisy but you need not worry. The process is very silent. The digital panel allows you to select preset temperatures for different beverages(White, Black, Green, Oolong, Herbal, and Coffee) in Fahrenheit or Celsius, as well as other features such as Auto-start, Auto-off, timer, keep warm and Auto-steep. It is possible to use it only as kettle just to boil water, all you need to do is to not press the pump function button. Another cool feature is that it will display the water temperature even when turned off. So you will know at any time the temperature of the water. The cord wrap underneath the base. For some tea drinkers, the keeping warm feature at only 160° (prevents overheating of the botanicals) can be a downside as it doesn’t keep the originally brewed temperature. Because of the water pump, it requires descaling more often than a regular kettle. Learn how to descale a kettle. Final conclusion. Is it really worth the money? My opinion is that it is definitely worth the money. The price is very acceptable compared to other tea makers such as the Breville One-Touch Tea Maker. It offers cool features, the most important is the pump function, and, it has a fancy look that fits any kitchen. 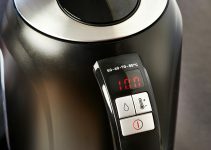 The unit heats quickly, and since you can customize the temperature settings, you can use it as a water heater as well as a tea or coffee maker. This machine is not a good choice for only tea perfectionists, but also for anyone that uses a kettle everyday for heating water. So, we need to thank Brewista for this great product! What is your opinion about tea makers? Have you ever used one? Would you use this one? Please leave a comment below. Also, like and share with your friends this review.